'Supercharged' Graphical Interface to maximize the User Experience! $29.95 or Free with Virtual Engine Dyno Professional Software Purchase! 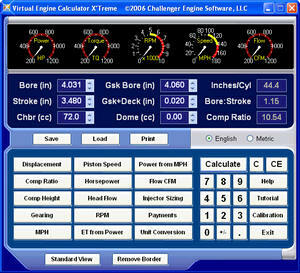 If you have enjoyed using our Free Virtual Engine Calculator, you will LOVE Virtual Engine Calculator X'Treme! Designed for use on Windows XP Systems Only (Home and Business Editions). 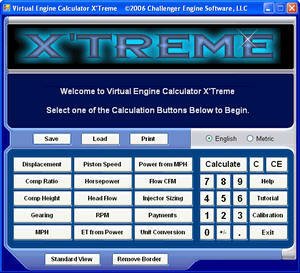 Virtual Engine Calculator X'Treme has been Designed to take Full Advantage of all the Graphics and Computing Power Windows XP offers! Includes all the computing power as our Free Virtual Engine Calculator with a 'Supercharged' Graphical Interface to maximize the User Experience! Automates the Calculations for Cubic Inches, Compression Ratio, Compression Height, Gearing, MPH, Piston Speed, RPM, Carburetor CFM, Injector Sizing, ET, Horsepower, Loan Payments and Unit Conversions! Visit our Purchase and Download Page to Get Started!